An event that the South Korean government dubbed “the Korean version of the Consumer Electronics Show” kicked off Tuesday for its inaugural three-day run with the participation of 35 domestic IT companies, including Samsung Electronics, LG Electronics, SK Telecom, Naver Labs and a number of small and midsize enterprises. The event was conceived about 10 days ago by the Ministry of Science and ICT, the Ministry of Trade, Industry and Energy and the Ministry of SMEs and Startups with the purpose of showcasing the latest technology trends -- seen at the US CES 2019 in Las Vegas earlier this month. Now those trends are on view at Dongdaemun Design Plaza in central Seoul where ordinary citizens and startup representatives can see them. The event, which has no official English name but in Korean is called the Korea Electronics IT Industry Convergence Exhibition, was reportedly initiated by Cheong Wa Dae -- but this is a claim the presidential office denies. The event’s organizer is the Institute for Information and Communications Technology Promotion, which explained that the purpose of the show was to offer citizens and startups an opportunity to benefit from the innovative ideas that were introduced at the US show. 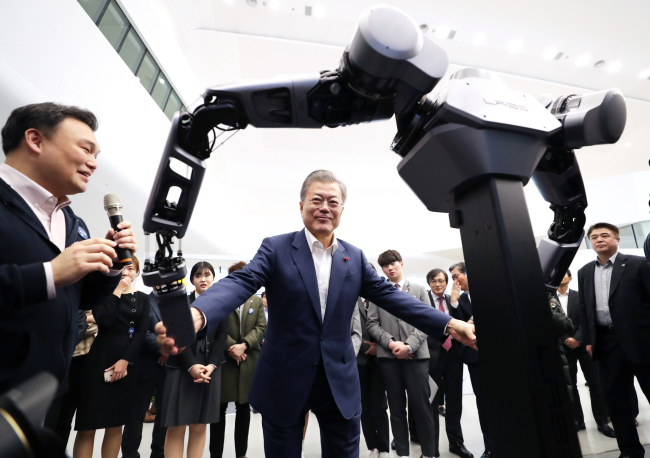 President Moon Jae-in made a personal appearance at the venue on Tuesday, meeting with representatives of participating companies and students before the opening to discuss global trends in the IT industry and measures to further develop the country’s manufacturing sector. “I came here not to give my message but to see your innovative ideas and listen to them,” Moon said. During the conference, Samsung CEO Kim Hyun-suk delivered a presentation on future technology trends seen at CES, in which he highlighted AI, 5G and new form factors. After a closed-door discussion with company representatives, Moon got a tour of the exhibition. Samsung and LG displayed their latest home appliances -- controlled and operated by domestic-service robots in a wirelessly connected smart home environment. Samsung exhibited its Micro LED TV, while LG boasted the world’s first rollable organic light-emitting diode TV, which won acclaim at the Las Vegas show. The companies also introduced an array of up-to-date products such as industrial robots, wearable robots to support people receiving medical treatment, automated driving solution systems, 3D augmented reality displays and hologram platforms.